NEW YORK, NEW YORK– [Excerpt] A new survey sponsored by Kessler Foundation and National Organization on Disability (NOD) finds that although corporations recognize that hiring employees with disabilities is important, most are hiring very few of these job seekers and few are proactively making efforts to improve the employment environment. These results, from the Kessler Foundation/National Organization on Disability 2010 Survey of Employment of Americans with Disabilities conducted by Harris Interactive, are especially important given the focus on employment by media and government and with October recognized as National Disability Employment Awareness Month. Distinction is made between “impairment” vs. “disability”, but perhaps not as often as should occur. In fact, it seems as if “disability” generally gets more usage. In a way, though, this article made me think that perhaps it should have been the Americans with “Impairments” Act (AIA) rather than “ADA”. If a person has an impairment, it does not necessarily mean that the person has a disability. E.g., if a person has a vision impairment, but is able to do a job (with reasonable accommodation), the person really does not have a disability, yes? When I read a quote like, “In fact, only 21 percent of people with disabilities, ages 18 to 64, reported that they are working either full or part-time, compared to 59 percent of people without disabilities”, I tend to think, well, of course, people who have disabilities, by definition, are prevented, even with reasonable accommodations, from accomplishing the tasks defined in the job requirements. The employment section of ADA was designed so that people who have impairments, but are able to accomplish a job, are not discriminated against because their impairment implies disability to the employer. Is this wrong-headed thinking in some way? In countries like Sweden that are committed to a humanist form of socialism, each person contributes to society in whatever way the they are personally able, and receive a living wage for their efforts supported by the re-distribution of wealth via taxation if the private market is not able to provide a living wage. It is a social system that values each human being. Captitalism basically demands that people prove their value; it very much believes in competition — “dog eat dog” values. Both systems have advantages and disadvantages. Right now in the USA, I see a people who are still firmly and deeply commited “dog-eat-dog,” with a Christian “throw the underdog a bone” philosophy overlay. 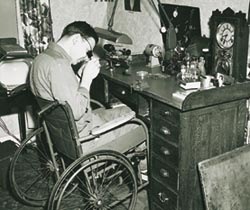 Does the disability movement seek to shift the country from a capitalist to a socialist perspective, or is it reasonable to think that people with disabilities (people who are truly having difficulty accomplishing the requirements of the job that are available), as opposed to impairments, can “fit” into our current economic system?